Hi, my name is John Downes and my involvement in the window blind industry started in 1996 whilst working for a national company as a self-employed window blind retailer selling direct to the public in their own homes. I enjoyed this immensely except for selling and installing conservatory roof blinds. They never seemed to fit properly and I noticed after talking with many other retailers working for this company, we all had the same problem. 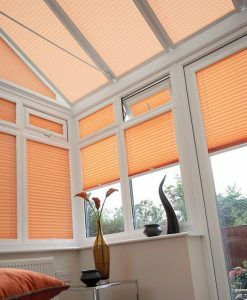 After months of research a company was found that offered a pleated blind system that gave a good fit for conservatory roof blinds. So in late 1999 I purchased the system myself and started making pleated blinds, installing our first pleated roof blind in February 2000. As the months progressed, other blind making equipment was purchased which enabled us to manufacture other types of blinds. We could then sell these direct to the public in their own homes, but now it was our name on the blinds and not a national company. At that time we were no different than any other company, and would use the cheapest materials we could find in order to drive the price down. We did however find out quickly that the cheapest materials and components did not last long and blinds we sold had to be repaired or replaced. Luckily we learnt our lesson, and now we only use the best fabrics, components and blind systems that are available today. Since 2001 we have only dealt with the big wholesalers which includes Eclipse Blinds, Louvolite & Amo Blinds. They supply us with the very best fabrics, components and blind systems. They have given us reliable products which has led to a loyal customer base. We are happy to say that 75% of our work is through recommendations and returning customers. When Louvolite introduced the “Perfect Fit” blind system in November 2005, we saw this as the ideal blind system to dovetail into our portfolio. It is also a computer based manufacturing system which has helped us immensely. We sought and gained full accreditation from Louvolite for the manufacture and installation of the “Perfect fit” blind system in 2007. The Perfect Fit Blind has now become the most requested blind in our range. Although the Perfect Fit Blind system is the easiest blind to measure and fit, some of our customers still find it daunting when ordering these blinds. Some people do not understand how to measure up, so we encourage them to call us and talk to us about any concerns they may have about this blind system. We offer friendly advice with no pressure and certainly no gimmicks. Please call us today on 0844 487 5845 and ask for me, John Downes. We are still a family owned and run Window Blind Manufacturing Company that is based in Wickford, Essex. It is now successfully run by my son in law and daughter who continue to offer a first class local service to anyone who would like to purchase our fantastic blind systems. We strongly believe in giving our customers the best price at the time of ordering. We do not have sale prices and we do not phone you offering a better price 24 hours after you requested a quotation. The price you see on our website is the price you will pay. We believe this is the fairest way of doing business with our customers. After all, if the lower price is available why wasn’t it offered first?